Takahashi FSQ-106ED @ f/5.0 (530 mm F.L.) Captured at 2.1 arcsec/pixel. Shown at 3.77 and 8.62 arcsec/pixel. SBIG STF-8300M Self Guiding Package w/ mono ST-i, using AstroDon 5nm Ha, 3nm OIII and Baader RGB filters. 1,410 min. (47 x 30 min.) "
336 min. (16 x 7 min. each) "
CCDStack to calibrate all sub exposures, register, stack and create the RGB image. PixInsight processing includes registering and stacking the Ha & OIII data, gradient removal and non-linear stretching with HistogramTransformation. PhotoShop for adding Ha and OIII data to the RGB image and the final touch up. The surrounding red emission nebula is part of Sh2-129, also known as the Flying Bat Nebula. 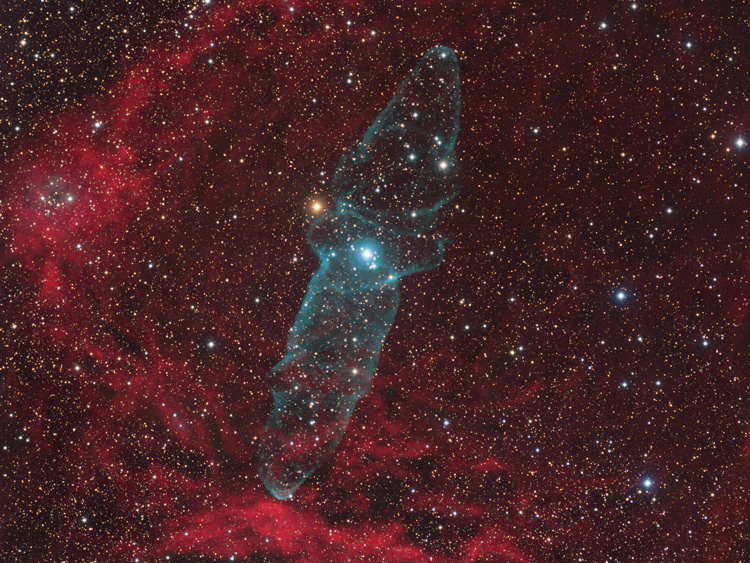 At the center, commonly called the Squid Nebula, is OU4. Amateur astronomer Nicolas Outters discovered this nebula in 2011. OU4 eluded detection because it is very faint and requires deep exposures with a 3nm OIII filter. Recent studies suggest that OU4 lies within Sh2-129 at a distance of about 2,300 light years in the constellation Cepheus. OU4 is believed to be a bipolar outflow possibly emanating from the triple star system, HR8119, located in the center of the nebula.